U.S. Senator John McCain has a long career of public service. After graduating from the Naval Academy in 1958, John McCain began his career as a Naval aviator. In 1982, he was elected to Congress representing what was then the first congressional district of Arizona. In 1986, he was elected to the United States Senate to take the place of Arizona's great Senator Barry Goldwater. 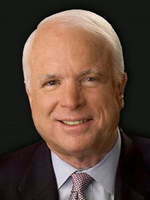 Senator McCain is currently the senior senator from Arizona. In 2000, McCain ran unsuccessfully for the Republican nomination for President of the United States. He is currently the Chairman of the Senate Committee on Commerce, Science, and Transportation, and serves on the Armed Services, and Indian Affairs Committees. Senator McCain has seven children and four grandchildren. He and his wife, Cindy, reside in Phoenix. Solicitor General of the United States - Jun 06, 2011 D Donald B. Verrilli, Jr.
SC Treasurer- R Primary - Jun 13, 2006 R Richard M. "Rick" Quinn, Jr.
Supreme Court - Associate Justice - Jan 31, 2006 R Samuel A. Alito Jr.
Supreme Court - Chief Justice - Sep 29, 2005 R John Glover Roberts Jr.
NY Assembly 62 - R Primary - Sep 14, 2004 R Mario Bruno, Jr.